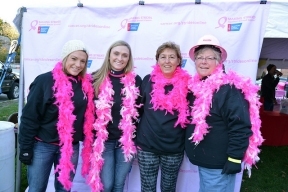 On Saturday, more than 100 employees, friends, and family members of ComEd and its parent company, Exelon, joined nearly 1,000 breast cancer survivors and supporters at the American Cancer Society’s Making Strides Against Breast Cancer walk in Park Ridge, Ill. As an extension of the Pink Hard Hat Initiative that launched in 2014, ComEd proudly sponsored the annual walk which raises money to help the American Cancer Society fund groundbreaking research and provide free, comprehensive information and support to thousands of men and women. Last October, ComEd launched its Pink Hard Hat Initiative and 500 ComEd crew members wore their pink hard hats while on the job throughout the month of October. Developed to create more awareness among ComEd customers and employees, the program was extremely popular and there were several requests to expand the initiative. ComEd responded with a company-wide pink hard hat offer and encouraged employees to make a donation to a cancer-based charity. 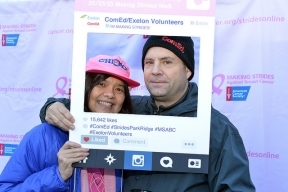 This year, nearly 900 hats were distributed and to date, more than $17,000 has been raised and donated to cancer-focused charities by ComEd and Exelon employees. In addition, the company launched a website that features stories from ComEd employees about the impact of breast cancer in their lives.